A multi-way boulevard is the key to revitalizing I-980 from an economic, social, and physical, detriment into a vibrant mixed-use and multi-modal corridor that increases transit capacity, improves walkability, and maintains adequate throughput for automobiles. A multi-way boulevard accommodates ample throughput, reconnects 12 cross streets connecting West Oakland to Downtown, provides space for regional transit below, and unlocks approximately 17 acres of new publically controlled land. A similar volume of traffic can be accommodated while creating a more pedestrian-friendly, human-scale roadway with through lanes for through traffic, better connections to and from Oakland destinations, and new local travel lanes for local traffic and bicycles. I-980 will become a new 6 lane multi-way boulevard between 20th Street and I-880 with 2 through lanes plus a local lane in each direction and left hard turn pockets. The new boulevard will follow the historic alignment of Brush Street allowing for the repair of the blocks to the west of the boulevard. The boulevard will allow for more fluid access from freeways to Downtown Oakland. Castro Street will become a two-way, two lane local street. An important benefit of the transformation of I-980 and reconnecting West Oakland to downtown is stitching the former urban street network back together and in the process creating new publicly-con-trolled land. The Connect Oakland multi-way boulevard solution repairs seven blocks west of the new boulevard and creates 14 new city blocks to the east, creating approximately 17 net new acres of public-ly-controlled land. This new land can be developed for any type of use or intensity that will best serve the interests of the City of Oakland. Not only does the multi-way boulevard solution improve the local connectivity of the City and recreate the urban block structure, but the redevelopment of the I-980 freeway can improve the image of the City from the I-880 freeway and improve the entrance character to Downtown. The view of downtown from the Nimitz Freeway is obscured by the current I-980 flyover ramps. 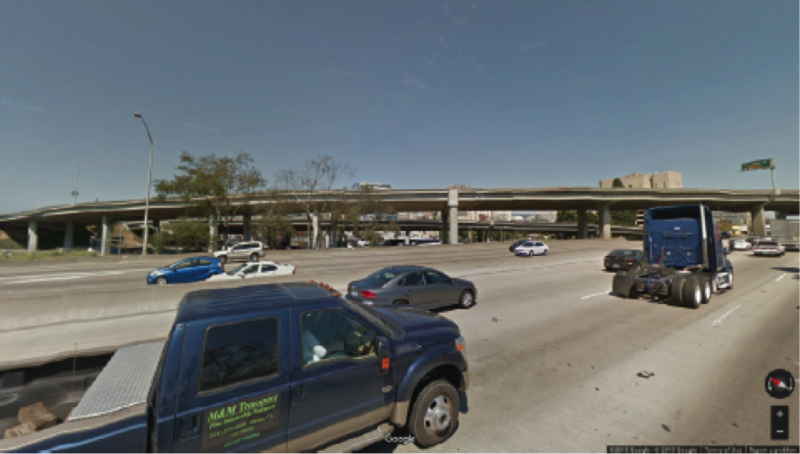 Removing I-980 will open up views of the skyline. Removing the giant flyovers that currently connect I-980 to I-880 will open a view of the skyline of Oakland from 880. A new, more appropriately scaled on/off ramp structure will provide a new front door to downtown Oakland, West Oakland, and the Jack London District and reduce conflicts with truck traffic. Removing the flyovers will reduce the overall width of the freeway and minimize the separation between Downtown and the Jack London District. The multi-way boulevard concept is also uniquely suited to support the expanded 21st century transit infrastructure that the Bay Area desperately needs.